Linear Announces Copper Cop, Simple Solution to Protect HVAC against Metal Theft. Easy to install with multiple levels of security, Copper Cop is a powerful deterrent against metal thieves targeting industrial HVAC units. Linear LLC, the leader in residential and commercial access control, emergency response and security solutions, announces Copper Cop, a new copper theft security solution designed to protect commercial HVAC units, one of the most frequent targets of metal thieves, from being stripped of copper piping and hardware. 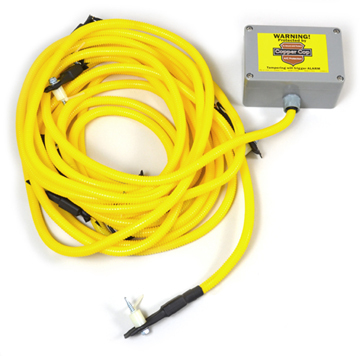 Designed for easy installation to the exterior of a commercial HVAC unit, Linear's Copper Cop includes a unique wire harness and patent-pending spring-loaded clips enclosed in a durable bright yellow casing that provides "Protected by Copper Cop" warning signage to deter would-be thieves. As simple as it is effective, the Copper Cop goes to work when anyone tries to remove the HVAC cover or disarm the unit. If breached, Copper Cop connects to a local siren while also transmitting an alarm signal to a Linear or other security system which then alerts the proper authorities. Copper Cop has advantages over existing HVAC metal security solutions as well. Since it is an alarm activation device, licensed security system installers can retrofit existing HVAC units without needing an HVAC installer's license or an electrician's license. Security system installers can install Copper Cop for commercial customers directly, or work with HVAC contractors to install and monitor. Integrating with existing alarm panels is easily accomplished with Linear's wireless Transmitter/Receiver Pair (DXS-31 / DXS-702). Copper and metal thefts are especially destructive because the cost of repair, replacement and insurance premium increases far exceed the value of stolen metal. A $10,000 HVAC unit can be rendered useless when the $75 worth of copper tubing is removed. This imbalance makes simple, affordable solutions like the Copper Cop even more appealing. According to the National Insurance Crime Bureau (NCIB), metal thefts have increased 81 percent since 2008, with copper by far the most frequently stolen material. Critical infrastructure sources like traffic lights and railway signals, farm equipment, construction sites and unoccupied buildings have all been targeted by thieves willing to risk personal safety and cause tens of thousands of dollars in damage for a few hundred dollars worth of metal. "We've seen countless cases of schools, businesses, churches and construction sites targeted by metal thieves, often because of inadequate security," said Duane Paulsen, senior vice president of product and market development for Linear. "Copper Cop is the simplest, most affordable and effective solution to combat copper theft because it provides a visual deterrent on the HVAC unit, an audio deterrent with the siren, and an immediate security response via integration with existing security systems." Even the federal government recognizes the threat caused by metal theft in an unclassified FBI intelligence assessment that states, "Copper thieves are threatening US critical infrastructure...and present a risk to both public safety and national security." For more information about Linear LLC, please visit www.linearcorp.com or call 1-800-421-1587. Linear can also be found on Facebook, Twitter, Youtube and LinkedIn. For over 50 years, Linear LLC has been an innovator in the security market. Linear's legacy includes the early application of passive infrared detection and radio frequency (RF) transmission, technologies that revolutionized the wireless security and access control industries. Today, Linear delivers class-leading wired and wireless products into a variety of markets serving the access control, security and home technology needs of its customers. Linear continues to expand its product and engineering prowess, leveraging the knowledge gained from strategic acquisitions and custom product development which will help lead the company into the next 50 years. To learn more, visit www.linearcorp.com. Linear LLC is a subsidiary of Nortek, Inc. a global, diversified company whose many market-leading brands deliver broad capabilities and a wide array of innovative, technology-driven products and solutions for lifestyle improvement at home and at work. Please visit www.nortekinc.com for more information.